Continental Computers has a partnership with Everdays that includes a direct integration for one-click, easy to use, integration with the Everdays service to help you quickly and easily help your families share the news of a loss. And, it’s completely free to the funeral professionals to receive the integration, as part of an exclusive deal, and courtesy of Continental Computers and Everdays. How does Everdays work with The Smart Director™ by Continental Computers? Create your case in The Smart Director and include any/all family members who want to share or contribute to the Announcement or receive condolences. Export the case to Everdays just as you post each case to your website. Family members added in The Smart Director case receive a text message and/or email. Family members download the app and share the Announcement with their network, upload photos, and receive condolences from those receiving the Announcement. Your home is promoted to everyone on Everdays. 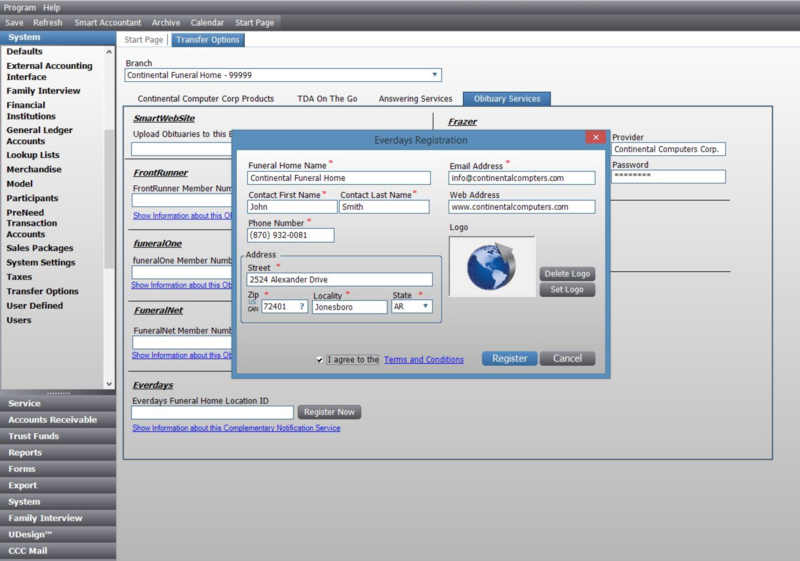 Go to System/Transfer Options and click on the Register button or setup a call with a Continental Computer Product Specialist to walk you through turning on the Everdays service. How do I send a new case to Everdays in The Smart Director™ by Continental Computers? At the end of your case creation process, on the same page you may send other data on the Export screen (within the Services tab), Everdays is listed. To export, simply click the logo. You will confirm the Informant's Information and select the family members who want to share the announcement, receive private condolences, and share cherished memories. Your client family will receive a text and email (if applicable) with the steps to take over the new announcement and instructions on how to broadcast to their family and friends. Are there any incentives to using Continental Computers? You may qualify for select incentives from Continental Computers during an upgrade. Call Continental Computers at 1.800.240.1016 to find out if you qualify. Who do I call with issues?